The Agriculture Committee considered bills this session clarifying the definition of hybrid seed corn, repealing the Black-Tailed Prairie Dog Management Act and supporting industrial hemp research. Introduced by Sen. Joni Albrecht of Thurston, LB276 clarifies the definition of hybrid seed corn and its related process of cross fertilization. Hybrid seed corn is limited to seed of the first generation of a cross involving two, three or four different inbred lines of corn or their combinations. Under the bill, the district court in the county where a violation occurs has jurisdiction to grant a restraining order or a temporary, permanent or mandatory injunction against anyone who sells or represents corn seed as a hybrid variety that does not meet identity standards. That is in addition to an existing criminal penalty for such a violation. The bill requires the director of the state Department of Agriculture — when he or she has reasonable belief that a violation is occurring — to report it to the attorney general or the county attorney in which the violation is occurring. The attorney general or county attorney then could pursue legal action. The committee also advanced legislation that updates the state Department of Agriculture’s authority to regulate those who provide eggs for human consumption. 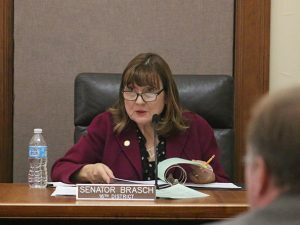 LB134, introduced by Sen. Lydia Brasch of Bancroft, repeals the Graded Egg Act and transfers authority for regulating egg-handling operations to the Nebraska Pure Food Act. The bill authorizes the department to establish standards, grades and weight classes for eggs and requires those who sell or package eggs to comply with any applicable regulations under the Pure Food Act. Senators voted 48-0 to pass the bill. A bill that would repeal the Black-Tailed Prairie Dog Management Act also was advanced by the committee. The act, passed by the Legislature in 2012, authorizes county boards to adopt and carry out coordinated management programs to control black-tailed prairie dog colonies. Though not part of the Black-Tailed Prairie Dog Management Act, a related area of current law authorizes the director of the state Department of Agriculture to cooperate with the Animal and Plant Health Inspection Service of the U.S. Department of Agriculture to manage and control nuisance wildlife, including black-tailed prairie dogs and other commensal field rodents. LB449, sponsored by Omaha Sen. Ernie Chambers, would remove black-tailed prairie dogs from that authorization. The committee advanced the bill to general file with an amendment that retains only the repeal of the Black-Tailed Prairie Dog Management Act. LB449 was not scheduled for debate this session. A bill meant to protect Nebraska apiaries from encroachment by out-of-state beekeeping operations was held in committee. Under LB499, sponsored by Sen. Tom Brewer of Gordon, Nebraska apiaries could voluntarily register the location of their hives with the state Department of Agriculture. An owner or operator of an out-of-state commercial beekeeping operation would be barred from locating any hives within three miles of any registered Nebraska apiary or hive. Registered beekeepers could report a violation of the quarantine to the department, which would investigate.